I made up a quick quiz for our Christmas party last night, and one or two people asked if they could have copies to recycle at their own gatherings, so here it is (below, click for printable PDF). 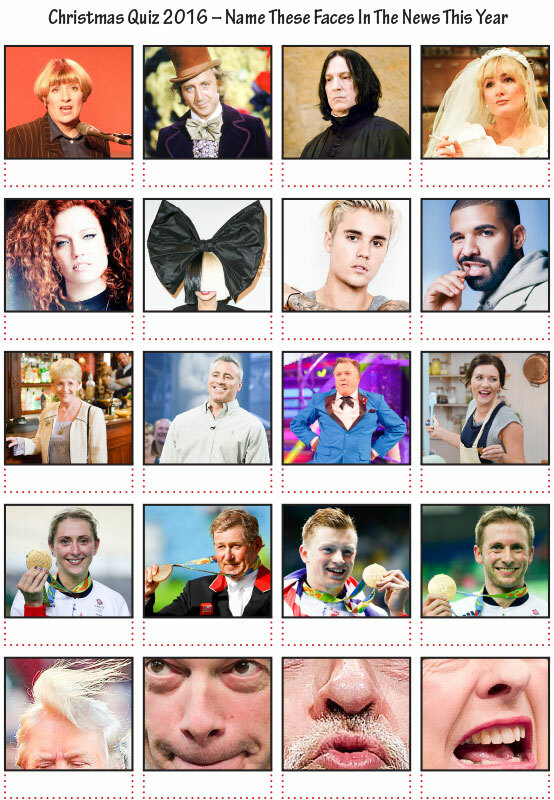 All entrants need to do is to identify the faces who have been in the news for good and bad reasons this year. Do use and enjoy, wherever you may be. I reckon it’s best tackled in teams of two – each row has a connection, and if people do it on their own and one of the rows isn’t their thing, they’ll struggle to compete. But teams of three or more might find it too easy. Our winners scored 19/20, only coming unstuck (perhaps surprisingly) on the very last one. …and here are the answers! If you print this out and use it, please give full credit as: “I got it off some bloke’s website somewhere”. Thank you.